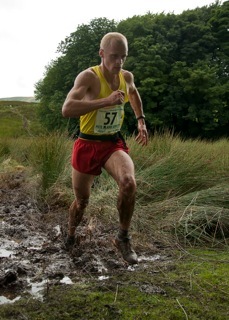 It was a great fell race preceded by and finished with a very tough cross county race. 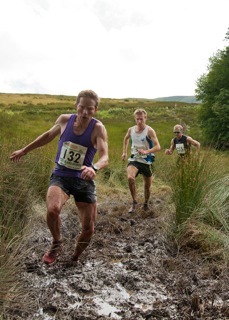 But when the cross country race finished and the fell race started, Mercia's Simon Bailey broke away and started to build a big gap. "Simon Bailey ran away and left us 'cos we we weren't good enough to keep up!" said one of the top five finishers. And here come the runners, well just one runner, as we thought, first is Simon Bailey, alone without any pressure. Morgan Donnelley, Tom Addison and Darren Kay getting ready to fight for second place - photo by Lisa Holmes.